Looking for a New Digital Camera? 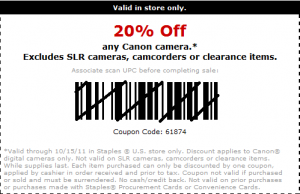 20% Off Staples In-Store Coupon Here! Go here to print this awesome coupon! Right now, they have a $229.99 Canon on sale for $199.99, so $160 after 20% coupon!